The best part is that it’s not another unused city plan, but that it’s already producing that 100% Model. First National Bank is seeking final approval for a truly innovative 4.5 acre, 2.5 block 4-story mixed-use urban village, with 90,000 s.t. of commercial space (four restaurants, offices, retail shops) and 106 diverse residences including studios as small as 420 s.f. (affordable), 900 s.f. 1BR/1BAs, 2BR/2BAs from 770 to 1500 s.f., and 3BR/3BAs from 1008 s.f. to 2400 s.f. 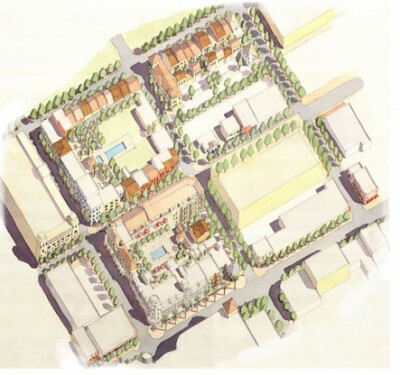 The parking is hidden, the place doesn’t look like it was designed by one company (it won’t be), and it has a true village feel with the varied building types at human scale – it should be rather obvious which are the 2.5 blocks that make up the project. It was also master-planned by the well regarded Dover Kohl – let’s just say they ‘get it’. It’s great to see South Miami return to its loyalty to stick with the original plan. Some years ago, the City looked the other way when the Shops of Sunset were first proposed despite the authors of the Hometown Plan (Dover Kohl) advising against it. And sure enough as some of your links point out, the Shops of Sunset are doing pretty bad financially. (The Shops is an outdoor mall inverted in itself and ignores its presence on the main street). In any case, South Miami is enjoying a great renaissance and it brings a unique pedestrian environment to an area of Miami that is so suburban; people have to drive miles away to experience a good urban environment. The 100% model is a great method to work with. There first phase was one small side street that gave a ‘taste’ to the people of what the Hometown Plan was, and people then bought into the concept. Phase two included the monster of the Shops, and its failed promises, which was a lesson taught to the public officials for straying. But at the very least it did include a redo of the entire main street, which aided in creating a good urban environment for the other stores and restaurants which further gave life to the city. The concept of completing pieces of the plan at 100% allows a city or developer to adjust the plan in later phases if something was off or didn’t work, without spending the entire budget throughout an entire area. As an urban planner, our general advice to any client is to complete streets, not blocks, as the public realm needs to be completed 100% for people to understand.